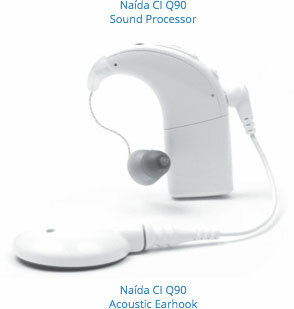 The Naída Link CROS is a wireless behind-the-ear microphone you can pair with your Advanced Bionics Naída Q90 or Q70 sound processor. You wear the CROS in a similar way to how you would wear a very small behind-the-ear hearing aid. You wear it on the non-CI ear. It comes with a small earhook, and also a plastic tube that that can anchor the CROS in the ear canal if desired. After trying the plastic tubing to secure the CROS, I decided it would be more comfortable to wear it with a small piece of double-sided toupee tape. I am not used to having anything that small behind my ear and could see myself knocking it off easily. I am also not used to having anything in my ear canal. The toupee tape can be purchased on Amazon or at a local beauty supply store. Just cut a small piece, put it on the CROS on the side you want to stick to your skin. The CROS is also backwards compatible with the previous generation processor, the Naída Q70. It uses a single size 13 disposable hearing aid battery. The battery lasts about 4 days for me on average. Advanced Bionics recommends PowerOne size 13 batteries, and estimates 3-5 days of life. My 4-day battery life is right on target! Batteries are available in local pharmacies as well as on line. The Naída Link CROS does not beep when the battery dies. At first, I didn’t necessarily notice when the battery died. After a couple of weeks, I would notice that something was missing and then discover that the CROS battery needed to be replaced. The CROS doesn’t have a T-mic, but it does have two mics that work wirelessly to complement your programs on the CI side. Everything you do on the CI side is duplicated on the CROS side. It’s automatic and very seamless. You power it on and off by opening and closing the battery case. There aren’t any buttons to press, so it is simple and easy to use. Once you close the battery case, the power is on. When you put it on your ear, it automatically pairs to your cochlear implant processor. There is a mute button you can press that will turn off the CROS. 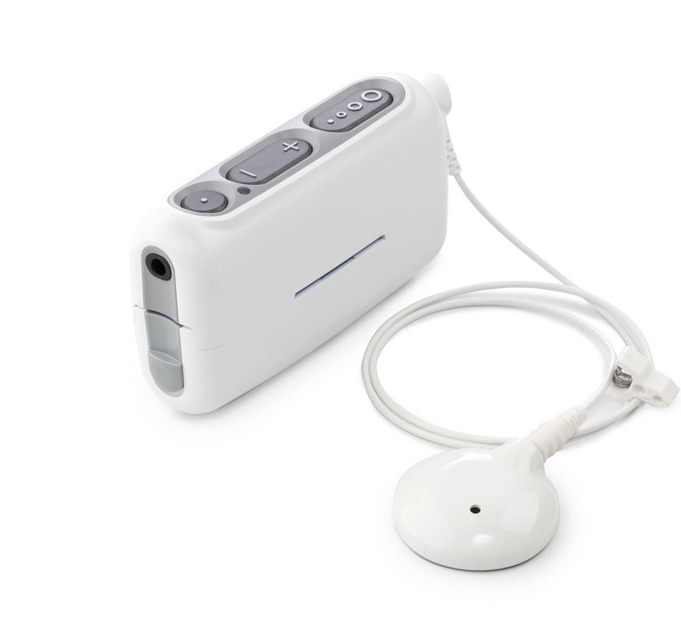 The audiologist pairs the Naída Link CROS to your cochlear implant processor. All you need to do is install a size 13 battery and put it on your ear. Everything is controlled by the Naída CI Q90 or Q70 processor. Change programs or volume with the buttons on the processor, the AB MyPilot, or the ComPilot, and the Naída Link CROS follows in lock step. The UltraZoom program on my Naída CI Q90 works beautifully with the CROS! It’s super nice in restaurants and loud places knowing that I can hear from both sides and am zoomed in to the max to the person in front of me. I feel more relaxed and no longer need to sit and position myself with my better ear facing people talking. I can pick up the conversation on both sides equally! StereoZoom is another program that uses sound from both devices to make a super-tight focus directly in front of you. This is probably best for extremely noisy situations, even noisier UltraZoom can handle. I don’t have StereoZoom as one of my options, but I will be sure to ask the audiologist for it next time! Because the Naída Link CROS always streams sound from one side to the other, there are no separate DuoPhone or ZoomControl programs. Listening to music with the CROS is interesting for sure! It’s not quite “bilateral” or stereo, but it’s nice to feel that the music is coming from all directions rather than just one side. Music coming in from all sides is more satisfying in a surround sound type of way. I am very fortunate to have great music with my CI, so that is carrying over to the right ear now with the CROS. The CROS is SUPER lightweight! I have to remember to remove it when I take off my CI. I cannot feel it on my right ear at all. I first tried the CROS in the audiologist’s office. An Advanced Bionics Clinical Specialist and one of the AB research audiologists were spending the day at my clinic. My audiologist sat on my non-CI side first. We did a little experiment with my hearing using only the CI on my left side. Naturally as expected, given the “head shadow effect,” her voice came in softer when she was on my right. I could understand her, but I wanted to turn my head to hear her better. Then she put the CROS on me, sat in the same chair, and started talking. I was stunned! She came in loud and clear, as well as if she had been sitting on my CI side. Next, I was tested in noise. The audiologist played speech babble over speakers in the room. She started talking again on the CROS side and I was able to carry on a normal conversation without looking at her or leaning over to get closer. The AB Clinical Specialist asked if it seemed strange to hear on the right side but have it processed by the left CI. I had to think about it, and it didn’t seem at all strange. I felt balanced and I also felt I was hearing on both sides as I should be hearing. There is less stress hearing on both sides. I felt more relaxed with two ears picking up sounds! My cochlear implant situation is a little different than most people who may be interested in the CROS. I do have a working CI on the right side. However, due to damage in my cochlea from a 1985 CI, I am missing some important speech frequencies. The right side only gives me bass sounds. That’s all great for music, but not for everyday listening. Listening to music with the CROS is interesting. Music sounds the same – it is, after all, being controlled by my usual CI programs. I have very very good music with my left CI and am super grateful to Advanced Bionics for giving me the extra pitches that bring out the melodies and harmonies. With the CROS, I was picking up the SAME good music I have on both sides. It was double the pleasure for sure! I do have the option of wearing both of my cochlear implant processors when listening to music, and that does have an additive bass effect. However, the binaural CROS option gives me a nice sound quality, so I am going to have to listen to a lot more music before I can decide which I prefer. In listening around the house and at a restaurant, it is so easy to hear sounds from both sides. It’s definitely more relaxing, less work, and much more natural when things come from both sides. I don’t know if insurance will pay for the CROS – it’s supposed to be an option for new AB users in the processor kit. Each clinic is going to set their own price for the CROS. My price will be different than yours. Bilateral cochlear implants are probably a better solution if that is an option. If you have a CI on only one side, or if you are like me and one of your bilateral implants doesn’t do particularly well, you may want to consider a Naída Link CROS! I have been an AB CI user for over 15 years. I lost my hearing at age 17, when I just woke up deaf one morning! This was 1971 and there were no CI’s back then. I lived my life in silence with lipreading. In 1985 I had an experimental CI put in my right ear. Only 16 of them were ever implanted. Mine failed after about 6 months. It was an interesting experience, but they had nothing to replace it with, so I spent another 14 years in silence after having to stop wearing it. In 2002 I decided to give CI’s another shot. After a huge amount of research, I chose Advanced Bionics, and it’s been the best decision I could have made. I was actually able to talk on the phone again two weeks after activation! It’s been an amazing 15 years being able to hear again. I am grateful to AB for always giving me new programs, new processors and innovative ideas to improve my life. The CROS is going to make a quality of life difference for me. I am grateful!